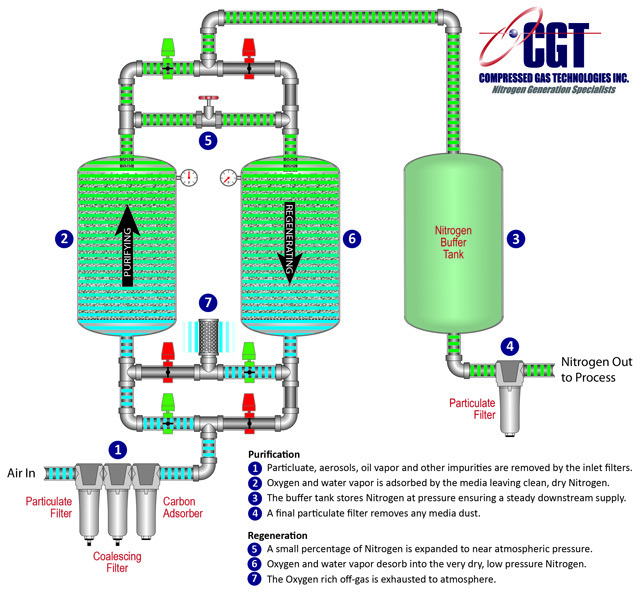 Compressed Gas Technologies offers several PSA nitrogen generators - learn about the technology as well as the generators we offer - which one is best for you? PSA technology utilizes two towers which are filled with carbon molecular sieve (CMS). Compressed air enters the bottom of the "online" tower and flows up through the CMS. Oxygen and other trace gases are preferentially adsorbed by the CMS, allowing nitrogen to pass through. After a pre-set time the on-line tower automatically switches to the regenerative mode, venting contaminants from the CMS. Carbon molecular sieve differs from ordinary activated carbons as it has a much narrower range of pore openings. This allows small molecules such as oxygen to penetrate the pores and separate from nitrogen molecules which are too large to enter the CMS. The larger molecules by-pass the CMS and emerge as nitrogen gas. PSA nitrogen generators are typically used in applications where the purity requirement is higher than 99.5% (0.5% O2 or below). PSA Nitrogen Generators are supplied to our customers as complete systems, ready for hookup to a compressed air supply, and includes air filters and controls for automatic operation. Getting started with your PSA Nitrogen Generator is simple too - just start up the PSA nitrogen generators by a switch and you're good to go. Maintenance is easy as well. You will only be required to change the filters on your PSA Nitrogen Generators every three to twelve months. PSA nitrogen generators come pre-tested, fine tuned and inspected thoroughly to ensure that our generators are set up to meet the specific needs of our customers - as every application's nitrogen flow rate and purity differ. One of the best things about PSA Nitrogen Generators are their ability to assist various businesses with on-site nitrogen production and the various applications PSA nitrogen generators are good for. PSA Nitrogen Generators also assist businesses with eliminating risks that are typically associated with liquid nitrogen or highly pressurized nitrogen and the best part is - it's extremely cost efficient.